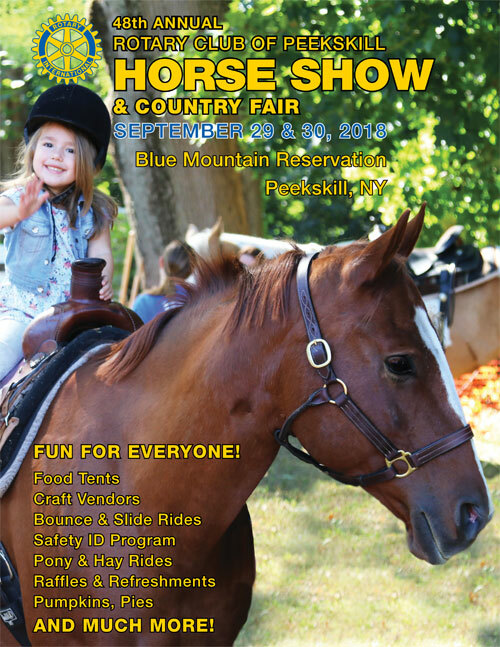 The Rotary Club of Peekskill will host its 49th Annual Horse Show and Country Fair October 5 – 6 at the Blue Mt. Reservation in Peekskill. Admission and parking are free and the show will go on, rain or shine. Competition and attractions will run from 9:00 a.m. to 5:00 p.m. on Saturday, and 8:00 a.m. to 5:00 p.m. on Sunday. to see advertisers sponsoring us. This is the only show in Westchester County with both English and Western riding classes. There are 28 Western classes with eight championships on Saturday, and 28 English classes with eight championships on Sunday. Riders from stables throughout the tri-state area participate in the show. Fair attractions include pony and hay rides, a country fair and craft market, bounce and slide rides for the children, and a “Kountry Kitchen” offering home-baked goods, pumpkins, apples and mums. In the food tent, Rotarians serve up burgers, hot dogs, chicken, sausage and peppers, fries, beverages, ice cream and pretzels. Breakfast is available for early-arrivers. To help promote bike safety for young riders ages 4-8, Peekskill Rotary and AAA New York will team up for the second time to host a Bike Rodeo on Saturday from 11am to 2pm. The highly regarded Masonic Safety ID Program offered by Courtlandt Masonic Lodge #34 will be offered again this year. The program provides parents at no charge with a CD including a child’s photo and background data to help law enforcement agencies more quickly recover a missing child. Blue Mt. Reservation is located on Welcher Ave. off Route 9. The Rotary Club of Peekskill was chartered 100 years ago. The club has about 80 members representing a cross-section of the Peekskill and Cortlandt communities.